I can’t start my day without breakfast. I get cranky, and lightheaded, and, well, it’s not a pretty picture. For me, breakfast is undoubtedly the most important meal of the day (unlike some other people, who refuse to eat breakfast!) So, since certain people refuse to believe my diet consists of anything other than sushi, it makes sense for me to come up with a breakfast sushi. Bacon, tamago, and green onion. All perfect in sushi. But it needed something else, something to make it truly a breakfast roll. Shoyu just didn’t do it for me, and maple syrup… way too sweet. Maybe, just maybe… yep, I know what you’re thinking, and yes. I did. A mixture of shoyu and maple syrup did this roll justice, and finished it off perfectly. If you ever wanted sushi for breakfast? This is your roll. Fry the bacon to the crispiness you prefer. Mix the shoyu and maple syrup well. 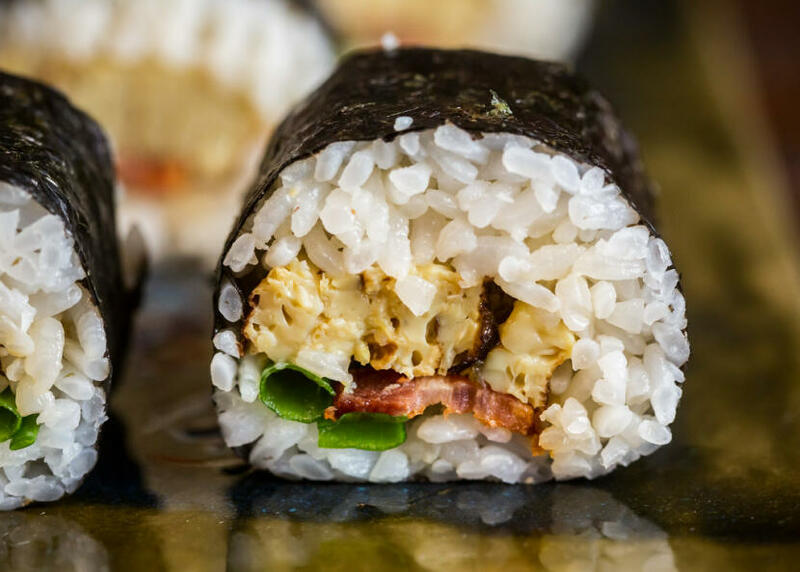 Roll the sushi, using two strips of bacon, some tamago, and a stalk of green onion as your fillings. Drizzle with the shoyu/syrup mix. It may not have been your intention, but all this has done is solidify my belief that you do not consume anything but sushi. 😉 Looks great, though! Looks great! Very creative. Maybe could use fried Spam as a sub for the bacon too. lol, you can have onigiri for breakfast… musubis… whatever you want to call them! 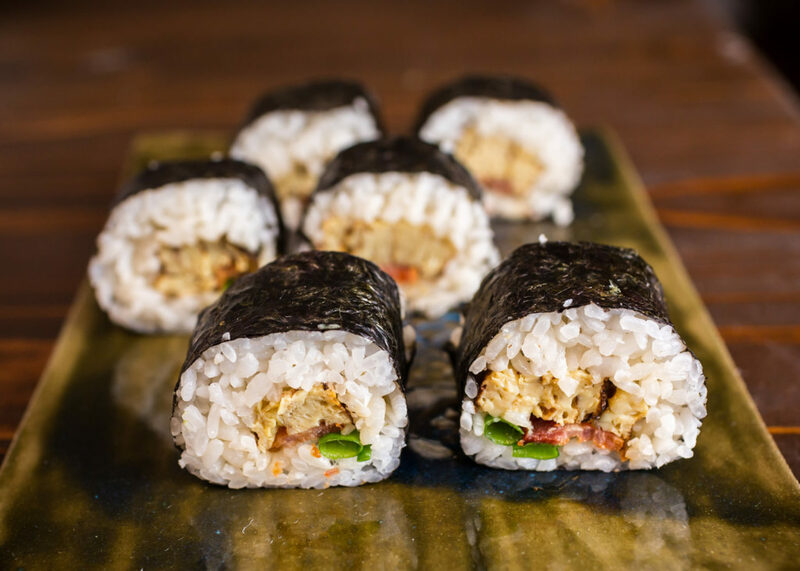 Come on… not just rolls! joann – Yep, you could use spam, or smoked salmon, or ham, or even sausage. Really, most any meat would taste delicious! I totally feel the same way, I must eat breakfast or else I become a BIOTCH! You have an awesome breakfast regimen! Oh look at that White on Rice… I cannot believe someone is using that what a great couple and a fab blog. As nice as this one!! HA! This sounds so good! Of course we might have to subsitute the bacon with… TURKEY BACON!!!!!! HOMG! Because Yue does not eat mammal!!!!!!! >.< Well next time I should but this in my tamago crazy bento (NO joke it’s like a f-ing sea of yellow in my bento) which I just made. I better buy some bacon now. And if you donâ€™t have time to make it in the morning, why not make it the night before and eat the next morning. Because on MY mornings Iâ€™m like this =_= and canâ€™t physically do anything till my friends come over and scream at me for putting juice instead of water in my coffee machine.